1. Cook the rice according to the pack instructions. 2. Meanwhile, heat the oil in a medium saucepan, add the onion and curry leaves and fry gently for 2-3 minutes until the onion is soft. Add the curry paste, fry for a further 2-3 minutes until fragrant, then pour in the coconut milk and tomatoes. 3. 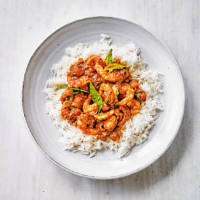 Bring the curry to a simmer, add the prawns and cook for 3-4 minutes until the prawns have turned pink and opaque. Remove from the heat, stir through the coriander and serve with the rice.